So the other day I was walking home from school and as I was walking by the dumpster I saw an old printer in there. I don’t know why someone was throwing it away but I didn’t care as I had more nefarious plans for it than simply spraying tree skin with black blood. 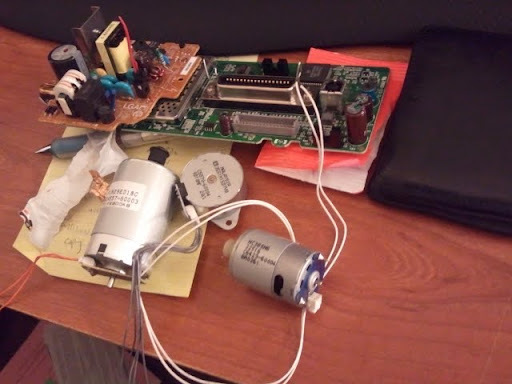 For a long time I’ve been reading about electronics, about hardware hackers and I thought it was time for some hacking of my own. As someone who doesn’t have that much spare cash to throw at buying the components I want I’ve been seriously interested in what other people are throwing away and how I can use it. 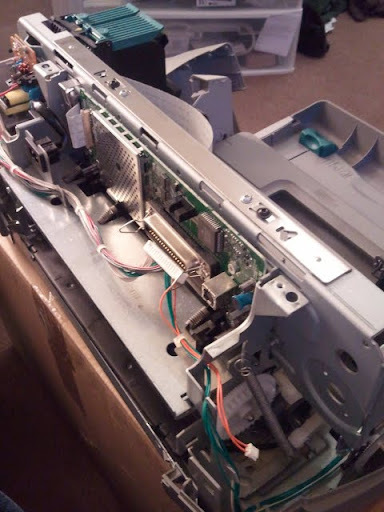 To that end this printer became my first victim. Tearing off the plastic case didn’t take too much and it exposed the electronics underneath. 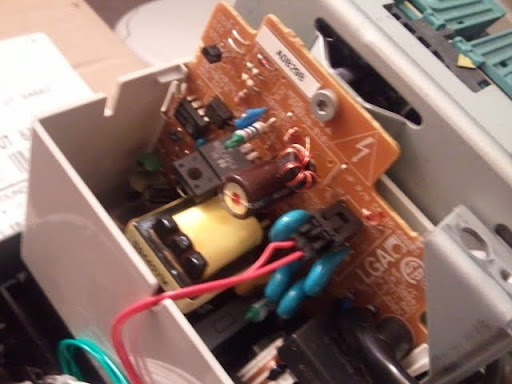 From just this old printer I pulled out two controller boards of questionable value but fun to see how the circuits workd and two prizes, a stepper motor and two DC motors. Not a bad haul since buying just those motors could have cost up to 30 bucks separately (new of course). After I pulled this stuff out and threw away the rest I realized that the next time I do this I am going to have even more fun trying to build a CNC using the actual physical hardware thought the steppers are usually too weak but it should be fun.